With 2014 upon us, I would like to thank my mentors and teachers for the lessons that have stuck with me from 2013. 1. Just because you are experienced in something, don’t assume you are above and beyond the proposed cautions – accidents often happen when the ego interjects and awareness gets left behind. 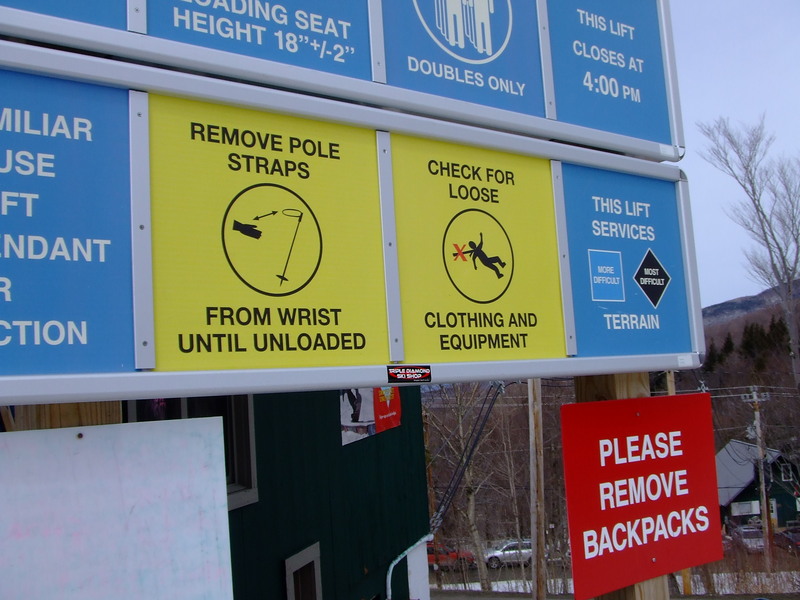 After laughing at the signs in the picture above, I snapped my ski pole in two by letting it dangle from my wrist and getting it caught on the platform at mid-station. I now ski with two mismatched poles because the lift attendant kindly gave me a pole that was left behind by someone else who ignored the cautions. We traded, actually – He took the two broken pieces in exchange for a pole that was intact. I didn’t ask if anyone had been choked by their loose scarf… I just choose to embrace my mismatched poles and trust the signs. 2. “The highest form of human intelligence is the ability to observe without judgment” ~ Saraswathi Vasudevan during a lecture weekend at Yoga Therapy Toronto’s studio. 3. “Pranayama (breathing techniques) are the only way to dissolve anger” ~ Prem Bakshi, one of the mentors whose presence in my life I will forever be grateful for. 4. “Through this experience, you will learn to protect yourself as you listen to and respect your own boundaries better” ~ my clinical supervisor. 5. My best friend asking me to be her maid of honour. I always knew I would one day play that role in her life, but the experience of being asked and invited into someone’s process of committing to a life of shared love with someone else is one that I don’t take for granted. 6. Age, love, and wisdom: there is a relationship between the three that became evident to me at my dad’s wedding in September. Committed, authentic, true romantic love requires wisdom. Wisdom just happens to (usually) come with age. 7. On the financial front: People who live modestly, within their means, without debt, and prioritize spending on the necessities balanced with what nourishes them, have all inspired me to reflect on our relationship with money and the impact it has on our wellness. 8. I love getting mail! One of my old tree planting buddies sent me a Holiday postcard. It was the only personalized mail I have received since his last year’s postcard. This time, he kindly used a picture of the two of us circa 2008 as the postcard itself. August Edward, from Thompson, Manitoba, thank you! The picture is on my fridge.This reminded me of the importance of connecting with the people we think about in ways that show that we care. 9. Anchorman 2 – the number of quotable quotes would require a blog post on their own. 10. Example of funny times: If you are sitting at a dinner table and are experiencing tension in the conversation, confidently change the topic by sharing that you have the ability to imitate an owl’s cry… and proceed to demonstrate. “You guys needed me at that dinner last night!” ~ Andre. 11. “Saying goodbye and parting ways with someone is sometimes the most compassionate thing you can do for yourself and the other” ~ A Buddhist Monk who led a meditation on transforming resentment into compassion. I attended the meditation in 2008 or 2009, but her words resonated most for me in 2013 as I explored what that actually meant in practice. 12. We live in a beautiful country. With my mother’s persistence, we visited the last province I had left to visit in Canada. That trip to Newfoundland, a couple weeks out west, and photos shared by friends who traveled internationally, inspired an intention to explore more. 13. With a new found state of presence and attention to things that matter, I enjoyed time with and the company of my family more than ever before. Dear family (I include life-long friends), I love love love you. 14. Mountains, trees, oceans: you have taught me the balance between Sthira and Sukha (stability and ease) and given me a point of reference when trying to grasp the experience of that balance. 15. Treasuring the beauty of vulnerability: the people in my work and in my life who have shown the willingness of being vulnerable in their openness with me have taught me things about myself. 2013 babies who have been welcomed into this world within my social circle have taught me the same (Arlo, Wren, Naomé, Oliver, Benoit). With much love and gratitude, Happy 2014! I enjoyed reading this so much Kat! thank you.